Reduce software development time and costs. codeBeamer ALM’s Software Development tool functionality enables your teams to collaborate efficiently on the development of complex software products. 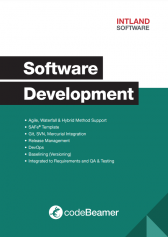 codeBeamer ALM’s software development tool capabilities are integrated with its Application Lifecycle Management feature set, and rely on a single central repository. Therefore, establishing relationships between all work items throughout the lifecycle and thus ensuring end-to-end traceability is simplified. Requirements, tasks, source code commits, and test cases may be simply or even automatically interlinked. A complete change history is automatically recorded on all artifacts, and is easily accessed using the Audit Trail feature or saved in baselines. Due to its flexible architecture, codeBeamer ALM aptly supports Agile, Waterfall, Agile-Waterfall Hybrid, and scaled Agile software development processes. The use of Scrum is supported by various features as well as a dedicated Scrum project template. 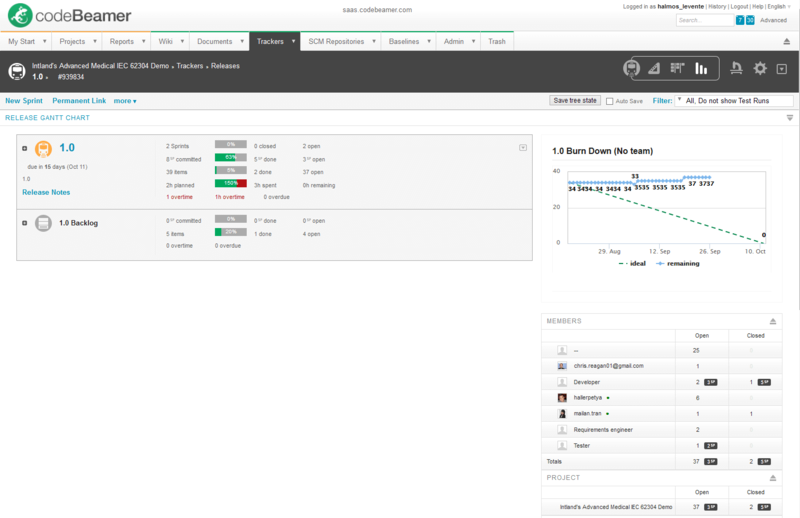 Highly configurable Kanban boards are available to support task and capacity management, and work process monitoring. Tasks may be simply assigned to releases. Statistics are available to monitor and analyze the performance of your software development teams. Advanced analytics features let you set up and share dashboards that are always up to date, and can be easily exported. ChatOps functionality is available to accelerate enterprise collaboration. Integrations are provided with all major version control systems including Git, Subversion, Mercurial, and CVS. A third party integration is available for PlasticSCM (plugin and support by https://www.plasticscm.com/). A dedicated SAFe® template supports the structured scaling of Agile across large organizations using the Scaled Agile Framework. codeBeamer’s REST API, out of the box integrations, and connection to Tasktop Integration Hub make it easy to implement in any development environment. Its workflow engine with BPM capabilities allow the unification of ALM and PLM. Powerful features simplify the parallel management of hardware, software, and service lifecycles. Intland Software’s safety-critical industry-specific templates allow you to maintain control over all software engineering and development processes in order to ensure compliance with industry regulations and standards in the medical, automotive, avionics and pharmaceutical sectors. Capture, define or import, and manage user stories, requirements, and tasks in a collaborative manner. Establish links between all artifacts for complete traceability. Use a WYSIWYG editor with attachments & comments, ReqIF documents, codeBeamer’s MS Office round-trip export/import functionality, and various integrations to collaborate with internal and external stakeholders. Use branching to manage multiple development streams. Ensure data consistency with codeBeamer’s out of the box integrations with a number of software tools and the Tasktop Integration Hub. Manage changes with codeBeamer’s ability to provide a complete change history on all your work items. Achieve data consistency throughout the entire lifecycle. codeBeamer ALM comes integrated with version control systems Git, Subversion, Mercurial, and CVS. A third party integration is available for PlasticSCM (plugin and support by https://www.plasticscm.com/). Save baselines (lightweight snapshots of all your artifacts) that allow you to “travel back in time” by browsing and comparing previous versions any time. Set up and manage repositories, commits, and merge codes. Define integrator workflows and link requirements to source code commits. Plan and monitor the progress of your milestones, releases and sprints using codeBeamer’s Planning Board. Manage and monitor resources & work execution using filterable artifacts, custom statistics, interactive Gantt charts, and burndown charts. Manage the work of multiple teams efficiently across different release streams or Agile Release Trains. Access up-to-date information on the status of all your development processes using flexibly configurable analytics dashboards. Define custom queries to retrieve any kind of lifecycle data from codeBeamer’s central repository, and visualize & analyze data using exportable and shareable reports. See release activity updates all in one place, and track the status of incidents and change requests. Align your teams and team members with preconfigured processes, and maintain permission control throughout the lifecycle. Define and enforce sophisticated workflows with optional guards and e-signatures. Maintain complete control over your lifecycle, and automate processes to save resources and to facilitate compliance with industry regulations and standards. Ensure your products’ safety, reliability and quality with codeBeamer ALM. Its dedicated risk management features allow you to identify, analyze, and control all your risks. 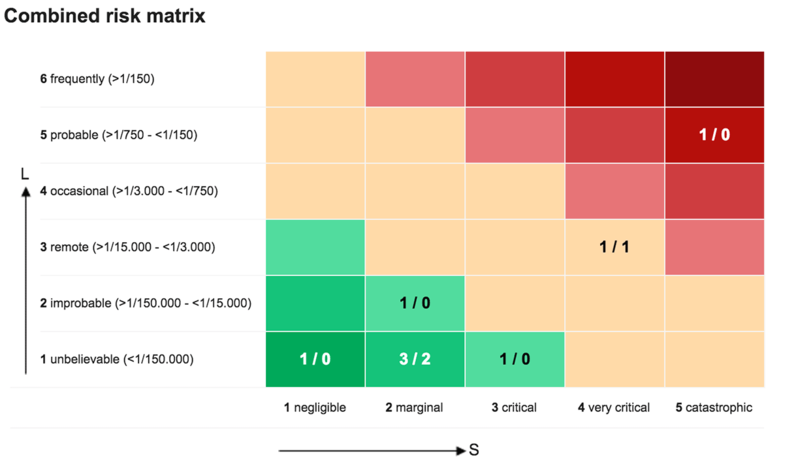 Display hazards in configurable Risk Matrix Diagrams, and export reports of all your risks & mitigation efforts. Enforce the use of mature processes to comply with safety-critical regulations and standards. Take advantage of codeBeamer’s fully integrated Quality Assurance and testing capabilities to enhance the quality of your products. Organize your communication in chat channels with ChatOps. Access lifecycle data, attach conversations to ALM work items, and execute actions in your ALM or other development tools right from the chat window. Use simple commands to execute actions in your ALM tool without leaving chat, or create your own bots to automate tasks. Using Slack and Mattermost, connect codeBeamer to 100+ software tools integrated including Github, Google Drive, JIRA, Zendesk, Jenkins CI, and dozens more. Integrate with AI, PLM, PDM, and other systems. Integrate codeBeamer ALM easily into your existing tool ecosystem. Ensure collaboration with internal & external shareholders via our MS Office (Word and Excel) round-trip export/import functionality, and dozens of integrations. 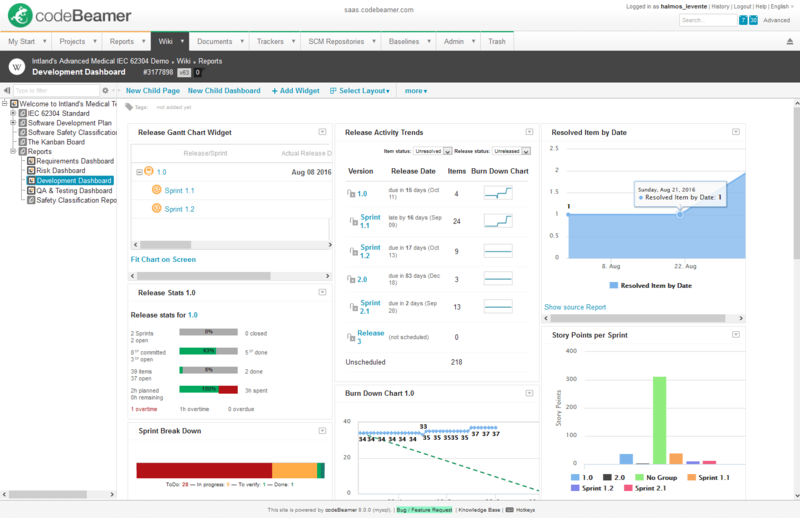 Connect customers to internal development processes using the Service Desk feature set. Take advantage of our DOORS Bridge native integration and ReqIF support. Create custom integrations via REST API, or use codeBeamer’s out-of-the-box integrations with JIRA®, MS Office, MATLAB Simulink, Enterprise Architect, and more. Ensure lifecycle-wide data integrity seamlessly using the Tasktop Integration Hub. codeBeamer is an excellent, enterprise class collaborative software development platform. The Intland professional services team provided excellent guidance in making our computer telephony integration (CTI) business requirement a success. 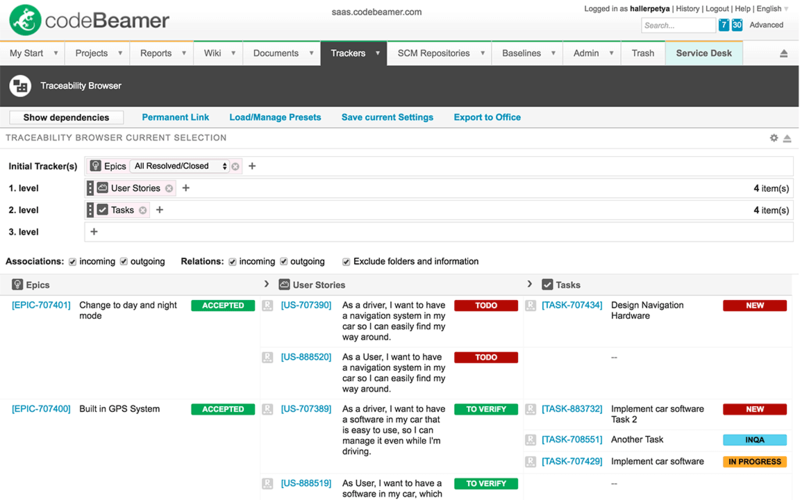 codeBeamer has proven to be an Enterprise-level ALM solution. Intland’s customer support is very responsive and quick to entertain any suggestions RT Logic may have for improvement and enhancement. RT Logic made an excellent choice when partnering with Intland. Also regarding RT Logic‘s yearly ISO audits for continued certification, codeBeamer reveals a convincing performance. Each of the auditors had very positive comments about the company‘s Project Portals and were especially impressed that each person with whom they spoke was able to find the requested information on the Portal and demonstrate its age and persistence. Is Mob Programming just a fad?